Shelley West Clark | Aim Media Midwest A photo of the Indians logo behind home plate at Progressive Field taken during field access on Thursday June 29. ballpark is featured in the first installment of a “Ballparks of northern Ohio” series. CLEVELAND — Being a life-long baseball fan, I try to attend as many live baseball games as possible. On Thursday, June 29, I attended the Indians afternoon game against the Texas Rangers. Cleveland came away with 1 5-1 victory over Texas to take three of four in the series. The Indians still sit atop the AL Central over the Minnesota Twins. Even with a 12:10 start, the contest drew a crowd of 23,996 spectators that witnessed another stellar performance from Indians’ ace, Corey Kluber. Since returning from the disabled list, Kluber has been pitching at top-form. Thursday was no exception as Corey went eight innings, allowing just earned one run, three hits, walked one and struck out a dozen. This was the fourth consecutive game that Kluber had fanned 10+ batters. His only hiccup game in the top of the first when he allowed a home run to right field off of the bat of Nomar Mazara with two outs. Despite a mix-up with exactly what access that I was granted, the day as a whole could not have worked out better. Upon picking up my pass, which consisted of a sticker to be placed on my person, the day began. Photographer Shelley Clark and myself found our way down to field level, which is apparently not where we were allowed to go. Later, Shelley and I joked that we could “go everywhere but nowhere”. Anyways, we were able to be on the field for the first pitches thrown out by a few locals but then escorted off of the field where we ran in to assistant media director Joel. Joel gave us a rundown of everything that one could take in during a visit to Progressive Field and where it was located. At this point is when we were officially informed that our trip to the actual playing field should not of happened and we all shared a nervous laugh about it. Shelley and I were then free to roam Progressive Field, within limitations of course. The first few innings of the ballgame were taken in as we sat in the first row of seats that arched behind home plate. With all of the professional or minor league games that I have attended, never have I ever had a view so absolutely perfect. Seated closer to the Indians dugout on the third base side, I was able to be up close to Tribe stars like Francisco Lindor, Jason Kipnis and Edwin Encarnacion. I snapped a picture on my cell phone of a few members of the club but if you want to see the good stuff, go visit Shelley West Clark’s Facebook page (also, XXII Photography). If you ask me I will tell you that when Kluber was coming off between innings, he looked right at me and nodded as to say, “sweet beard and cool Galion Graders hat man”. Now, what to experience and to expect at a Tribe game up in Cleveland. What to see: Heritage Park is the Cleveland Indians area dedicated to its’ Hall of Fame members. One level even includes past Indians’ greats that are enshrined in Cooperstown. Throughout the stadium, you will also find tributes to said players and even a few statues located at entrances around the park. What to do: Plan on taking the little ones with you? Progressive Field has you covered! Check out the Kids Clubhouse that has a little bit of everything for the kids and parents to share in together! Need more details on this and other things to take in? Visit the Indians’ website at www.indians.com. Hungry? Thirsty? Progressive Field prides itself in putting an emphasis on local food and drink! In addition to the Corner Bar, a two-story hangout in the Right Field District, you are able to find local breweries and their respective beverages throughout the stadium. May I suggest a refreshing adult beverage from Great Lakes Brewing Company or Fat Head’s Brewery? Melt Bar and Grilled, Happy Dog, Ohio City Burrito, Cleveland Pickle, Momocho, Dante’s Inferno and the Brew Kettle are other local eateries that are represented within the confines located at the “corner of Carnegie and Ontario”. It is clear that Ohio loves their Indians. Roaming the concourse that was clear to see among the crowd of red, blue and Chief Wahoo. In conclusion, I would like to extend a special thank you to the Cleveland Indians staff for the opportunity. 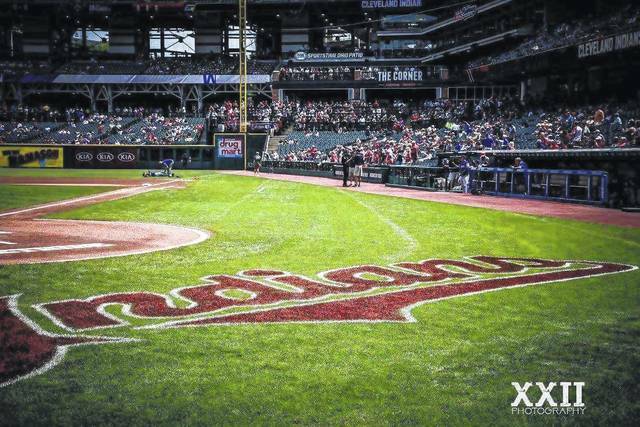 https://www.galioninquirer.com/wp-content/uploads/sites/38/2017/07/web1_Progressive.jpgShelley West Clark | Aim Media Midwest A photo of the Indians logo behind home plate at Progressive Field taken during field access on Thursday June 29. ballpark is featured in the first installment of a “Ballparks of northern Ohio” series.